Find #1 Sun Lakes Realtors for all of your real estate needs! If you are searching for Sun Lakes Realtors, you will want to talk with The Kolb Team. 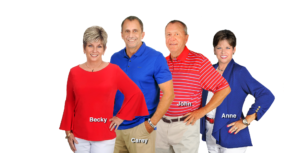 As a top producing real estate team specializing in Sun Lakes Arizona real estate, you will find a wealth of knowledge about the community and real estate trends. If you are buying a home you will want Sun Lakes Realtors that knows the area. Not only does The Kolb Team work in Sun Lakes, we live here too. We know first hand the ins and outs of the homeowner association, the real estate trends, floor plans and most importantly how to negotiate when you are ready to make an offer on a home. Our experience in the Sun Lakes real estate market will be valuable to you in knowing whether it is a seller or buyer market and how you need to negotiate to receive an accepted contract. And, we have partners that you will need in the process such as lenders, title and escrow officers, home warranty companies, repair and handyman contacts and much more. As an ABR (Accredited Buyer Representative) we have the experience to successfully represent you as Sun Lakes Realtors. Selling a home requires a Realtor that knows the market and has proven results! 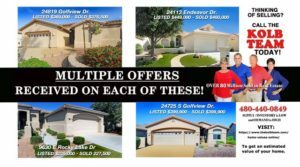 If you want to sell your home for the most money possible in the shortest time, then your Sun Lakes Realtors should be The Kolb Team. We beat the competition when it comes to average sales price, days on market and sale to list price ratio. Average sales price in 2017 for listings sold was $349,802. Average days on market was 44 and sale to list price ratio was 99%. That means, on average, our listings sold at 99% of list price in 44 days. Our closest competition was 97.5% and 55 days. And, the best part is that 38% of our listings in 2017 sold at or above asking price and some had multiple offers! Our closest competition had only 20% of their listings sell at or above asking price. Are you ready to find the #1 Sun Lakes Realtors to list or buy your home? Contact us here or call us 480-440-0849. This is the most amazing team. If you want to buy or sell a house this these are the people to call. Very knowledgeable, professional and always ready to help! Simply the best real Estate team in Sun Lakes. They treat you line family. Would highly recommend them for buying or selling a home. This is a great team that knows this market. You won’t be disappointed if you choose The KOLB Team for your real estate needs.